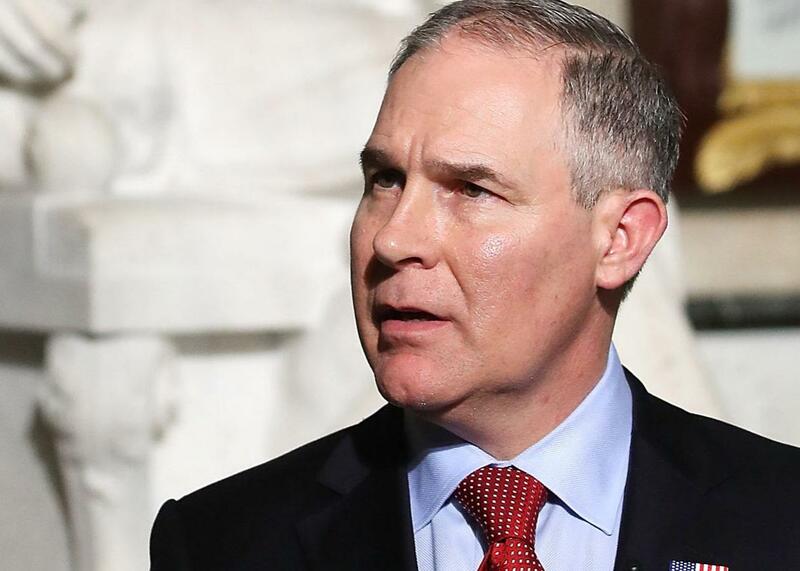 Pruitt’s coal mine is owned by people who want to get out of coal mining. The owners of the mine have been trying to get out of the coal business for years. EPA Administrator Scott Pruitt does a television interview at the U.S. Capitol on Feb. 27. This story originally appeared in the New Republic and is republished here with permission through Climate Desk. Harvey Mine is an obvious choice for Pruitt’s speech. Owned by the 153-year-old energy company Consol Energy, it’s part of the Bailey Mine Complex, the largest underground mine in North America. Bailey, which began operations in 1984, is located in Washington and Greene counties, huge coal communities that together employ 7,350 people in the coal industry, about 2,000 of them at Bailey alone. The Harvey Mine, specifically, began operating in 2014, bucking the national trends that show far more coal mines closing than opening. Pruitt might point to the Harvey Mine as evidence of coal mining’s bright future. But a closer look at the Bailey complex shows it’s hardly a shining example of profitable, environmentally friendly coal mining. Last year, the EPA and the Department of Justice fined Consol $3 million for discharging contaminated wastewater from the Bailey complex into tributaries of the Ohio River, which provides drinking water for approximately 3 million people. In addition, all three mines in the complex have racked up millions of dollars in Mine Safety and Health Administration violations—particularly the Enlow Fork Mine, which has been hit with more than $3 million in fines recommended by MSHA since 2006. Granted, it would be a challenge to find an American mining operation that hasn’t broken environmental laws or struggled financially over its lifetime. But Harvey Mine is a bad symbolic choice for yet another reason: It’s owned by a company that wants to get out of the coal mining business all together. Consol has been mining coal in Appalachia since 1864, and as recently as five years ago the company was the fifth-largest coal producer in the country. But in late 2013 it sold five of its West Virginia coal mines to focus on growing its natural gas business. In 2016, Consol paid another company $44 million to take over its last two coal mines in West Virginia. A Consol spokesman said at the time that the deal “represents the final piece of our coal divestment strategy” in Central Appalachia. Today, the Bailey complex is Consol’s only remaining coal interest—and in January, the company announced its intention to sell or spin off that as well for similar reasons. A Consol spokesperson didn’t respond to my request to confirm whether that’s still their intention, but in March the company told Bloomberg News that it was working with two financial firms, Credit Suisse and Bank of America, to find potential buyers. A recent public securities filing from CNX Coal Resources—a Consol spin-off company that runs the Bailey complex—also confirmed that Consol has a “desire to divest” from the facility. [Deiuliis] acknowledged that a relaxation of regulations on mining and carbon emissions under the Trump administration would help coal. But not enough to persuade Consol to stay in it. If anything, the optimism injected into the coal sector by the election result and the re-emergence of large miners from bankruptcy … simply provides a window to offload the business. Everyone but the Trump administration, and certain Republicans, accepts that coal is dying. And the most convincing evidence comes from coal companies themselves. In public securities filings, CNX acknowledges the massive decline in coal consumption in America, which it attributes to “general economic conditions,” “indirect competition” from renewable energy and natural gas, “energy conservation efforts,” and government regulation. Loosening a few EPA rules won’t suddenly make coal more profitable than gas, and it certainly won’t make it cleaner. Even the owners and operators of the Harvey Mine admit as much. Maybe they should be giving Pruitt a speech, rather than the other way around.